This is Part 1 (ranks 1–10) of my ranking of books read in 2018. See also Part 2 (ranks 11–30) and Part 3 (ranks 31–52). As in previous years, I resolved to briefly review books in order to ensure both close reading and a modicum of memory. In the process, I maintain a (rough) ranking, which I lightly edited recently to account for how books stuck with me even months later. For some of these books, I wrote longer reviews earlier, to which I link. 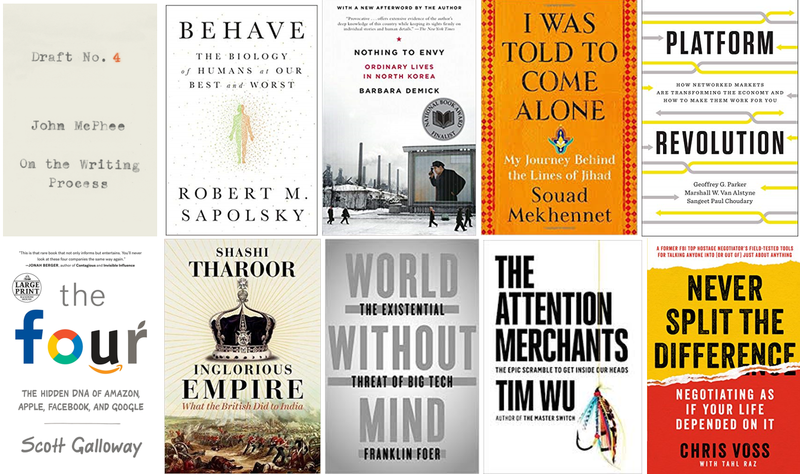 Below are the top ten books I read this year. They’re all non-fiction, though the first is a collection of “creative non-fiction” articles found in the New Yorker. Four relate to large tech companies and online platforms, with three taking primarily critical positions — perhaps preparing me for the recent turn in the media’s coverage of such companies toward such a skeptical view. Three are ‘geographic’ non-fiction, covering the history and present of North Korea, British imperialism in India, and various terrorist groups. 2. Behave, by Robert Sapolsky. An excellent, sweeping, and comprehensive book that serves as a primer on the science of human behavior. Professor Sapolsky, a Stanford neuroendocrinologist, walks (in sometimes mind-numbing detail) the reader through what’s going on in a human the seconds, hours, days, months, years, and centuries before she performs an action. One underlying point is that all facets of our behavior are inextricably tied to biological factors that are often beyond our control; it’s not just our impulsive behaviors that are controlled by biology. Our inclinations, thoughts, and desires are as well. Sapolsky uses this point to then argue (essentially as Professor Strawson does here) that our understanding of moral responsibility and criminal justice is wrong — the distinctions we make, for example, between those we deem mentally fit to stand trial and those we don’t, are crude. There’s no reason the treatment based approach — vs the the blame and imprisonment approach — is appropriate for some but not others. However, unlike most pop-science books, Sapolsky doesn’t misrepresent the trees for the forest. The book is long, and the author uses most of that space to discuss scientific literature. Most importantly, Sapolsky readily acknowledges that 1) on most points, the literature is an ongoing debate with competing theories and their believers, and 2) he’s not an expert in most of the areas and so his interpretations and criticisms are not definitive. Despite these caveats, he does not shy away from sharing judgments based on his personal experience. 3. Nothing to Envy, by Barbara Demick. One of the more depressing books I’ve read recently. It details the last 40 years or so of North Korean history, through the lens of several North Koreans who each defected within the last 20 years. The book presents their lives in roughly chronological order, through the depths of the famines of the 1990s and each of their eventual defections. Probably the only thing that surprised me was how bad things got in the 1990s and how much the government described mirrors that of Orwell’s 1984. (A smaller surprise was hearing about how those that escaped to China would often return to North Korea for smuggling purposes). The book itself was fantastically written, by a journalist who has spent many decades following the regime and befriending defectors. Possibly the only thing missing — something that I think would have made the book the best I read this year — was the story of someone who was much higher up in the regime. The stories in the book are varied but somewhat the same; those profiled range from the bottom rung of society (due to their Japanese heritage) to the middle class (with someone with a prestigious engineering education from Pyongyang). Each of the defectors faced fear, hunger, and loss from the Orwellian regime. None were party members, though several hoped to be. I’m left wondering what the lives of party members, especially those very high up (some of whom have defected), were like during the famine years and other times, how aware they were of others’ struggles, and what eventually caused them to defect. 4. I Was Told to Come Alone: My Journey Behind the Lines of Jihad, by Souad Mekhennet. I have too many great things to say about this book; it’s simultaneously a memoir and a behind-the-scenes reporting of some of the most important stories related to terrorism in the last two decades. The author, a Moroccan-German Muslim journalist, recounts numerous interviews with leaders of terrorist groups, as well as their victims. How she gains such access and trust of so many is incredible. She doesn’t shy away from telling truth to power, even in the face of immediate and mortal danger. Mekhennet once told a jihadist that the “real Jihad” would have been to stay in the West and succeed in spite of the challenges that exist for Muslim immigrants, and she was the first to confirm and cover the CIA’s part in the kidnapping and torture of (sometimes innocent) terrorism suspects. The book does leave one (almost) hopeless on the challenge facing the West in the face of extremism. Even with the best of governments and policies, it’s difficult to counter the narratives of racism and lost opportunity, as well as the allure of simple and sweeping religious answers, that produce more terrorists. And with the governments we have, it’s near impossible. 8. Never Split the Difference, by Chris Voss. Entertaining and useful book on negotiating from the lead international FBI negotiator on kidnappings. Full of both principles, examples, and specific phrases and tactics one can use in a negotiation. Turns out that a large part of successful negotiation is asking the right questions with the right phrasing and tone. 10. Attention Merchants, by Timothy Wu. A history and present of advertising, including how technology companies have hijacked our minds. The book argues that the following advertising cycle is common: a new medium/idea arises, and advertisers enter; eventually, hucksters and traditional companies alike overreach (by being overbearing or disingenuous), sparking a public backlash and government intervention; the advertisters curb the worst of the excesses but as a whole adapt in a way that only increases their aggregate influence. Throughout the process, such “attention merchants” have found ever more insidious ways to enter previously sacred places and occupy the time, energy and attention of people. a) At one point, apparently AOL was shipping out 50% of the CD ROMs in existence. b) AOL’s downfall had a lot to do with fraudulently boosting its advertising numbers apparently. c) The first mass marketing/spam email (sent out to about 300 email addresses on the Arpa-net) apparently received a Pentagon response that warned wthe senders. d) Pepsi was one of the first to commoditize the counter-culture, using anti-”the man” messages to further its corporate needs. PhD student at Stanford. Usually write about books but occasionally about technical issues. Find me at gargnikhil.com.